Most people can’t afford to drop $165 on a vape mod. It’s a lot of money, especially when there are plenty of decent box mods for under $60. Running DotMod’s proprietary dotCHIP, this gorgeous mod is a brilliant performer in all modes – even temperature control is very impressive. It hits hard and fast and the accuracy (in all modes) is very impressive. Performance is definitely up there with Yihi and DNA-powered mods, only in this context the mod you’re using looks a hell of a lot better. In fact, I’d go as far as saying this is my favorite vape mod of all time (in the context of looks and design). 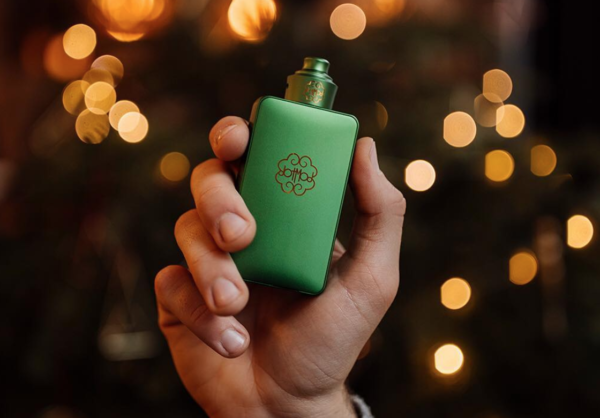 If you can stomach the price ($165.95), the DotMod Dotbox V2 Box Mod is easily one of the finest vape mods you will ever have the pleasure of owning and using. The main event here is design. The DotMod Dotbox V2 Box Mod is perhaps one of the most aesthetically pleasing mods ever created. I named it, alongside Rig Mod’s Mech Tubes, inside our guide to the world’s most beautiful vape mods. The attention to detail, the overall finish, and the build materials are all utterly sublime. It looks and feels premium, every inch of it. And it comes in several eye-catching colors too: Black, Gold, Red, Blue, and Green. The vape mod itself follows a more “classic vape mod design”. It’s boxy, to be sure, but its beveled edges and soft lines, which give it a very distinctive and ergonomic feel, really help it stand out from the crowd. I just love how tidy the entire look it. The fire key and adjustment buttons are made from 24-carat gold. I also really like the size of the fire key; it’s deliberately oversized for easy access. The only break in the design is a USB port just below the adjustment keys. The display – a 0.9in OLED panel – is detailed and bright and shows you everything you need to know about what’s going on – from battery life to the resistance of your coils. On top, the 510 is located towards the right-hand-side and can handle tanks of ALL sizes without overhang. For me, this mod is physically perfect. The design language and build materials used are all flawless. As soon as you unbox it you know EXACTLY where all that extra money went. If you want quality of this grade, you do have to pay for it. 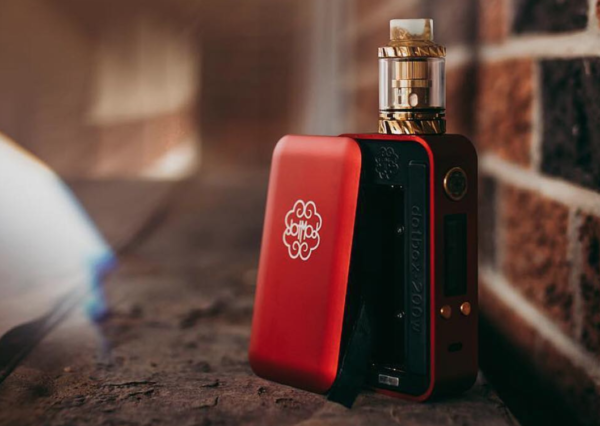 DotMod used to use DNA chipsets in its mods, but with the DotMod Dotbox V2, it switched over to its own, in-house chipset – the dotCHIP. This was obviously a massive risk. EVOLV’s DNA chipset is brilliant in every regard, so switching to an untested platform for a device of this price was always going to a little unnerving for DotMod. In my experience, however, the dotCHIP is utterly fantastic. It can handle both power and temperature control vaping, as well as things like the ability to lock in certain resistances and outputs. In power mode, the performance is monstrous. It fires instantly and delivers 100% of the power right off the bat. I honestly have no complaints about the DotMod Dotbox V2 in this context. Like a DNA or YiHi mod, the power is delivered consistently and reliably. I don’t do much temp control vaping, but I always test it when I get a new mod. Again, the dotCHIP excels here. Performance is stable and accurate just as it should be. Making small changes to the temperature yields changes in flavor, again, just as it should. 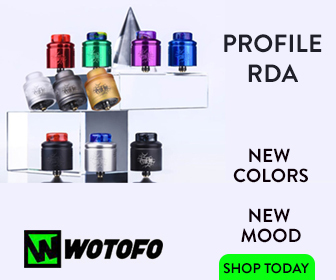 Is it better than a YiHi or DNA mod? Honestly, I don’t know. Probably not. But it is damn good, and for me, that’s all that matters. The DotMod Dotbox V2 is also cheaper than most YiHi and DNA mods too; this is likely why DotMod decided to make its own chip (lower costs in the long run). And then you have the different power modes. I tend to leave mine as is, but you can alter how the power is delivered and, unlike on a lot of mods, it actually makes a difference to how your vapor tastes. This thing is basically like the Porsche 911 of vape mods. Expensive, yes, but utterly beautiful and insanely powerful. 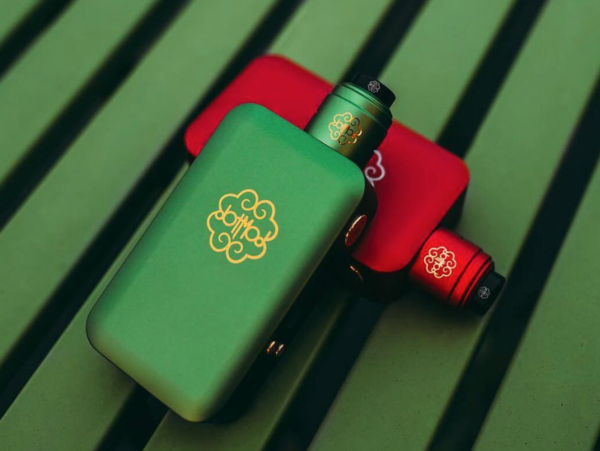 Should You Buy The DotMod Dotbox V2? I own A LOT of vape mods. Hundreds, in fact. But none are as good looking or as well put together as the DotMod Dotbox V2. In this context, it is very much in a league of its own. In fact, I can’t really think of anything that is quite as cool looking as the DotMod Dotbox V2. But it’s not just looks this vape mod has in spades. It’s also a brilliant performer too. 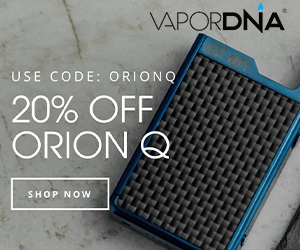 You have excellent temperature control, insanely powerful wattage mode vaping, and plenty of additional settings for those that like to tinker around with things. It is expensive, granted, but you’re getting A LOT of quality here. Quality performance, quality build materials, quality craftsmanship, and a truly unique looking device that is unlike anything else on market right now. It won’t be for everyone, but for those that value quality and don’t mind spending a little extra to acquire it, the DotMod Dotbox V2 vape mod is just about one of the greatest devices of its type on the planet right now. I wouldn’t trade mine for ANYTHING.